5 STARS FOR SURE!!.. LOVE..LOVE.. I have been looking for something like this for a month. I'm always spilling my drinks ugh and I know I'm not the only one lol. Thank you for designing this. I purchased the chocolate brown it us prettier than the pics. This pillow is awesome. We have a couch with no table next to it so guests had a hard time with their drinks when they wanted to put them down. This worked wonderfully. We mostly use it for drinks but you can put snacks, pen and tablet or other items in it so it's easy to grab and holds items without worry of a drink spilling or items falling off the couch. We're very happy we found this item! Karen C.
While the Cup Cozy Pillow is designed to serve as a cup holder and help prevent spills, Cup Cozy Pillow, LLC makes NO claims that your drink WILL NOT spill when it is used. It is incumbent upon the user to exercise caution and care when using the Cup Cozy Pillow, particularly when used to hold a hot beverage as to prevent any possible injury. 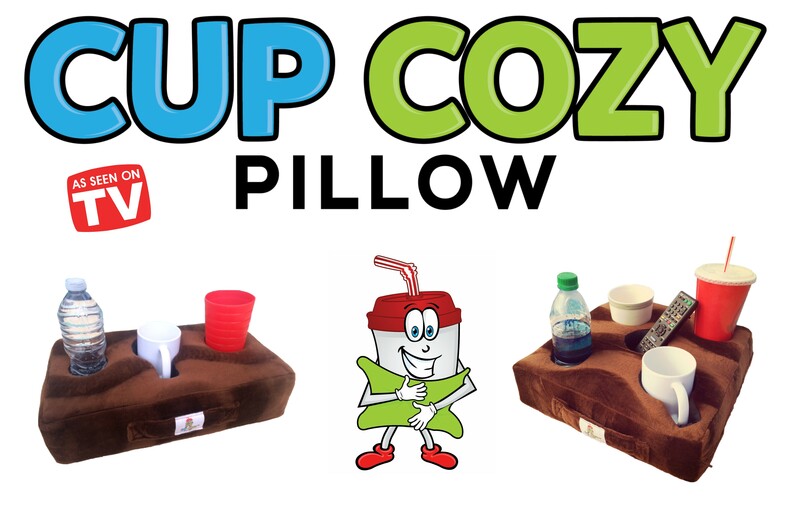 Cup Cozy Pillow, LLC will NOT be held responsible for any stains, injuries, and/or other damages to yourself, others or any personal articles from any spills that may happen during the use of any products made by Cup Cozy Pillow, LLC. Any spills resulting in damages/injuries from the use of a Cup Cozy Pillow are the users sole responsibility. By purchasing and/or using the Cup Cozy Pillow you agree to these terms.